What Triggers the Story Ideas? 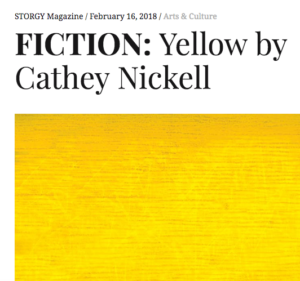 I’ve only written one short story, and a London-based online site called STORGY Magazine recently published it. Here’s a link to “Yellow,” which was inspired by something my father said in passing one day. Dad was looking at a brochure for a company that offered time-shares on a yacht; he thought it looked fun and showed my mother. Practical Mom was NOT interested, and Dad’s short-lived boat-dream faded soon thereafter. When I got home from visiting them, I couldn’t shake this idea that was forming about couples and how they reach decisions. Whose career comes first? How are financial decisions made? Does one person get their way more than the other? I sat down and wrote “Yellow.” It has nothing to do with my parents, but Dad’s yacht-brochure-peruse triggered in me a creative moment. A short story was born. Another time I was driving my son, Will, to school in our SUV. I was joking about the many (18+ and counting!) bumper stickers I have on it; he began to tease me, saying, “No one cares about your bumper stickers, Mom.” I dropped Will off at school, and my brain was on fire the whole drive home. I went inside, ignored the pile of tasks I needed to tend to, and instead pecked out the first draft of what would eventually become my first children’s book: Arthur Zarr’s Amazing Art Car. I wrote a blog about it. I’m currently working on my second book—a middle grade story based on a unique experience that happened when I was in the third grade growing up in Shreveport, Louisiana. I’m not ready to share the exact premise yet, but the idea came from a real-life occurrence. For now, I’ll refer to it by a code name—The Bee Book—that perhaps will make sense … someday! The initial idea to write about my childhood mishap came to me in 1989. I had been out of college for four years and was working as a Publications Director for a medical clinic/surgery center. Before work one morning, I read an article about actress Ally Sheedy. 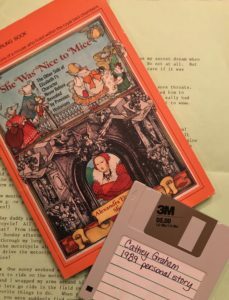 I learned that while at New York’s Bank Street School, 12-year-old Ally wrote about a mythical encounter between Queen Elizabeth I and an inquisitive mouse. The result, She Was Nice to Mice, was published in 1975 by McGraw-Hill and became a bestseller. 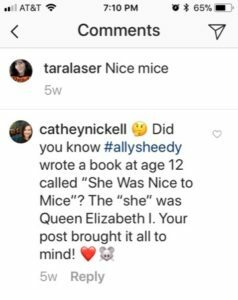 Children’s book author, Tara Lazar, posted a photo of “nice mice” on Instagram, and I commented. Tara’s response made me laugh! We think alike. I also liked the rhyming style of Ally’s book title, and the name for my future book popped into my mind. I knew what I wanted to write and what it would be called. I arrived at the clinic, did my regular work, and patiently waited for my lunch break. During that one-hour time slot, instead of eating, I typed out five single-spaced pages on green copier paper I had swiped from the office supply closet. This was before computers were commonplace, so I used one of the office’s IBM Selectric typewriters. I later transferred it to a word processor, and I still have the 3.5-inch floppy disk! Those original five green pages became the first draft of The Bee Book (remember, that’s merely a code name, not my real working title). It wasn’t even a middle grade chapter book at the time. It was simply a clever turn of phrase, a few funny references … but an original story for children, nonetheless. I filed it away. And there it sat for about twenty-five more years! Fast forward to 2015. I was working on Arthur Zarr’s Amazing Art Car, and my creative juices were awakened during that project. 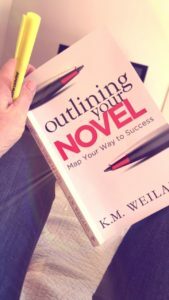 I was frequently thinking of new story ideas, jotting them down in a notebook. That’s when I remembered The Bee Book, which was still tucked away in a file cabinet. I hadn’t seen it since 1989, and when I pulled out those old green sheets, I laughed at how truly bad it was! My writing has improved over the years, I thought with relief. 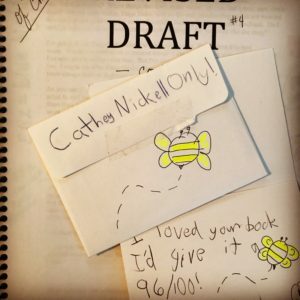 As terrible as it was, I realized that I held in my hands a craptastic outline of what might possibly become my first middle grade children’s book. 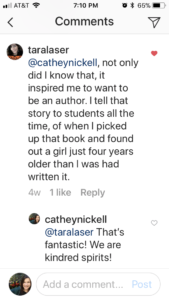 My 8-year-old niece Meghan also critiqued my middle grade story.